With the longer days and warmer temperatures here lately, it's been nice spending time out on the porch. No longer grabbing a coat to let the pup out and encouraging her to "hurry", I just sit on the porch and rock. 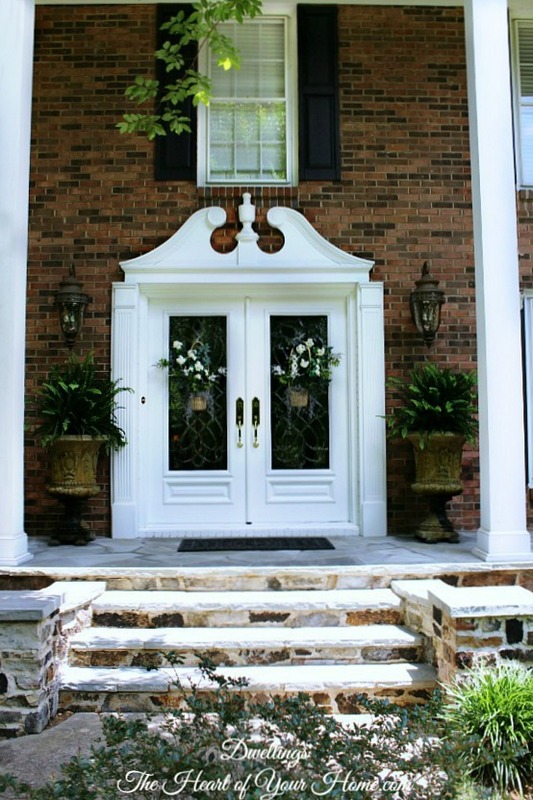 so I headed out to get some spring flowers for this southern front porch! like these from last spring. 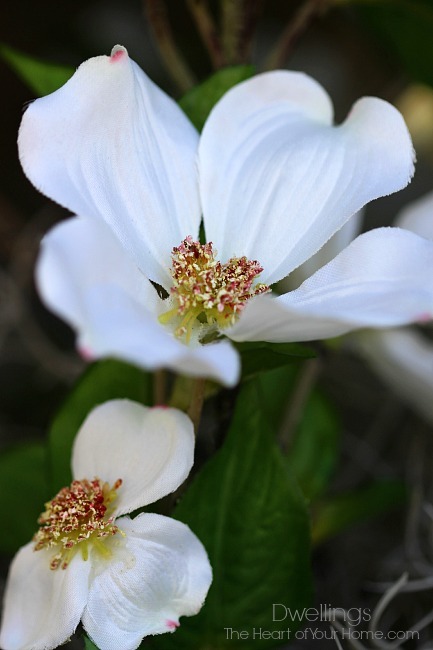 The dogwoods are just beginning to flower here in NC and they are gorgeous! So I filled the sweetgrass baskets with dogwood stems and moss. I've been trying to decorate for spring this year with little to no cost. 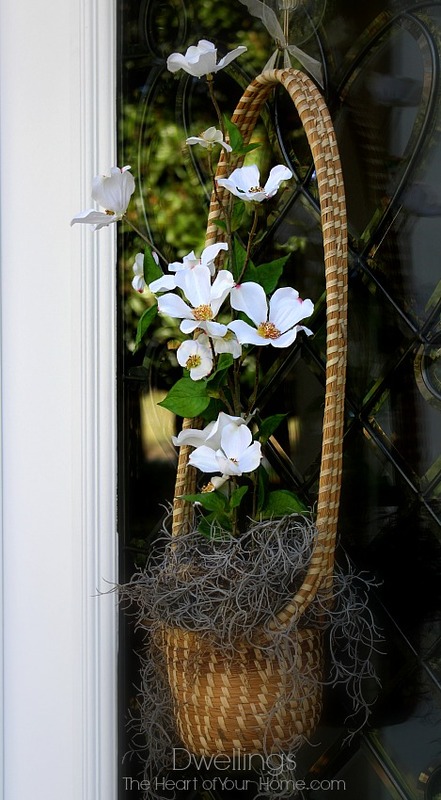 Investing in baskets that can be used over and over again, the spring touches for the front doors was only $6 each for the dogwood sprigs. The geraniums were only $8 each, so it was only $28 to add spring flowers to the front porch! 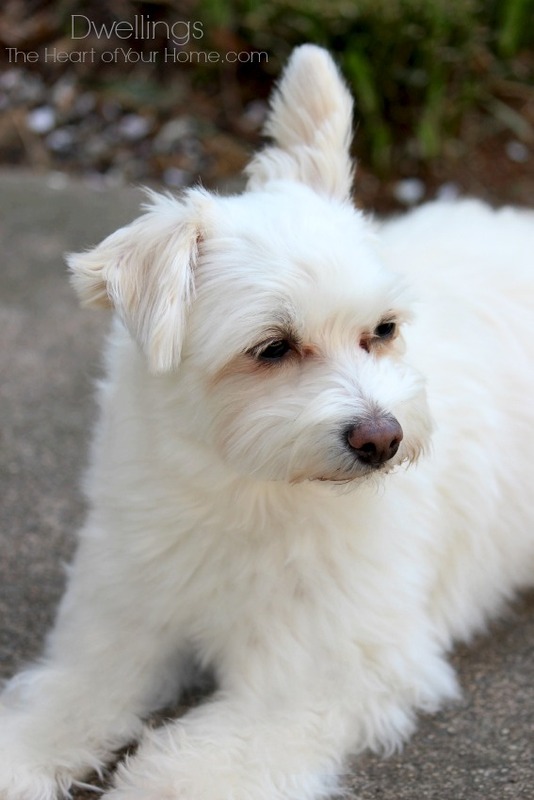 Ellie-Mae was keeping me company and watching for squirrels to chase. Have you started planting spring flowers? Hop on over to see this weeks features and home tour at AMAZE ME MONDAY! Oh, so lovely! Have a wonderful Wednesday! Oh, I love red geraniums. They are in my top three favorite plants. They will be lovely in the planters. You made a wonderful choice. 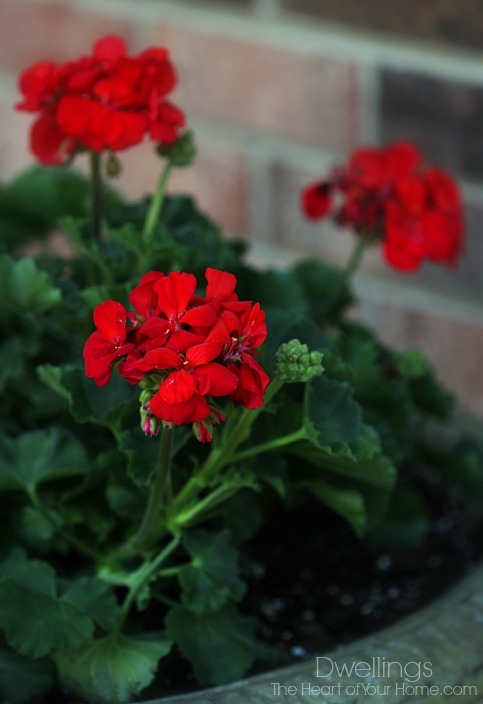 Red geraniums are such a cheerful flower - and so classic. They look wonderful on your porch. You have inspired me to start working on the front porch! I sometimes use ferns and sometimes red geraniums. I love both. In Ky I usually wait until,after May 1 to plant in the ground...but the urns on my front porch can be started. Thanks for nudging me forward with your post. Completely Southern and completely beautiful! Hi Cindy, Your porch looks lovely!! I agree with you that geraniums are very southern (ferns too). I have to say that salmon pink has been my favorite color of geranium for years; I look forward to planting some this year. I'm enjoying my pansies right now, but I imagine they will soon be getting leggy, too. Your sweetgrass baskets are just charming; I regret I didn't buy one when we were in Charleston last spring, but they're so pricey. If we go back though, I plan to get one for sure. :) Enjoy the lovely weather today and have a great rest of the week! 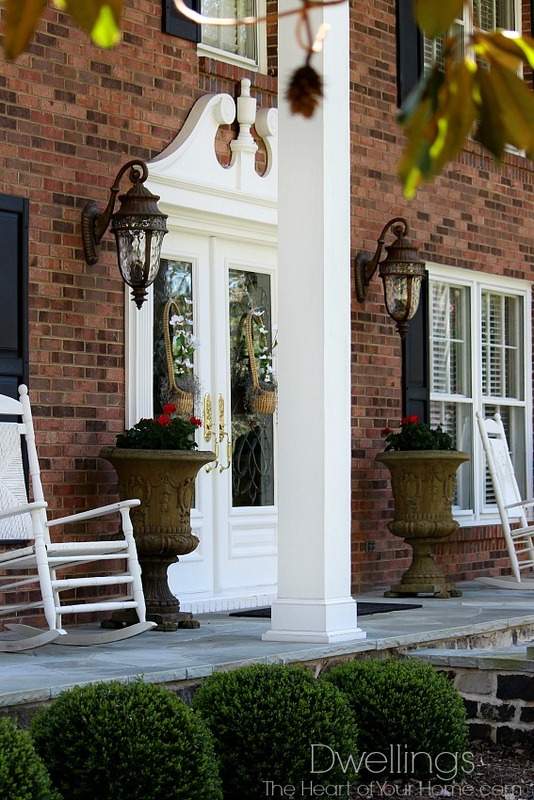 Cindy, your front porch looks so beautiful, a true southern front porch:). I just love the red geraniums! We have a new puppy and I am looking forward to not hurrying him up and rocking on my porch just like you as soon as it finally warms up here in PA:). How do you keep those baskets from flopping around when the door is opened and closed? 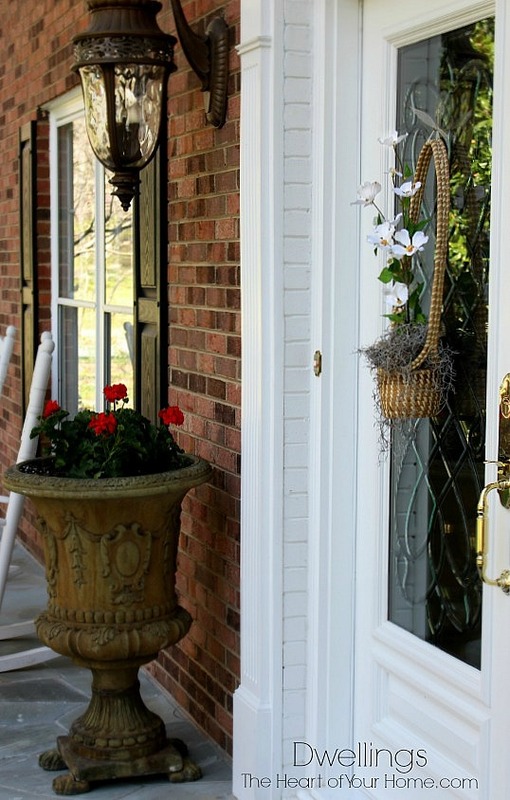 Your porch always looks beautiful Cindy! 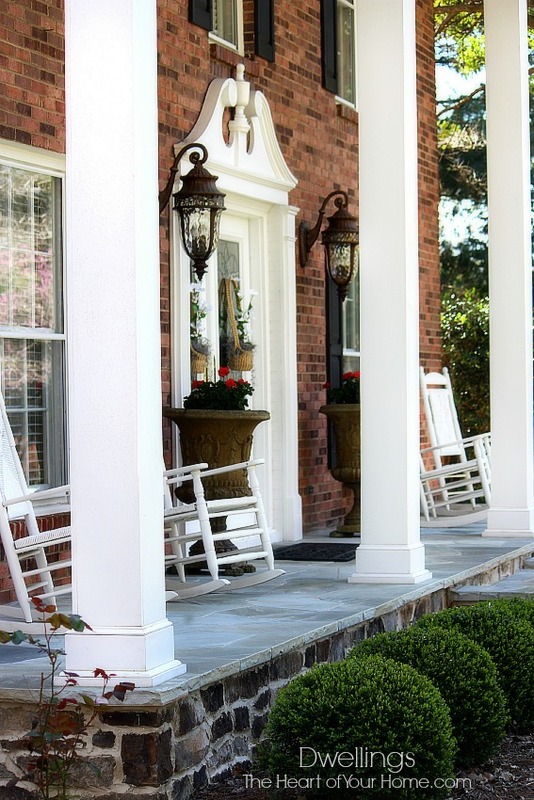 What a truly gorgeous Southern front porch. 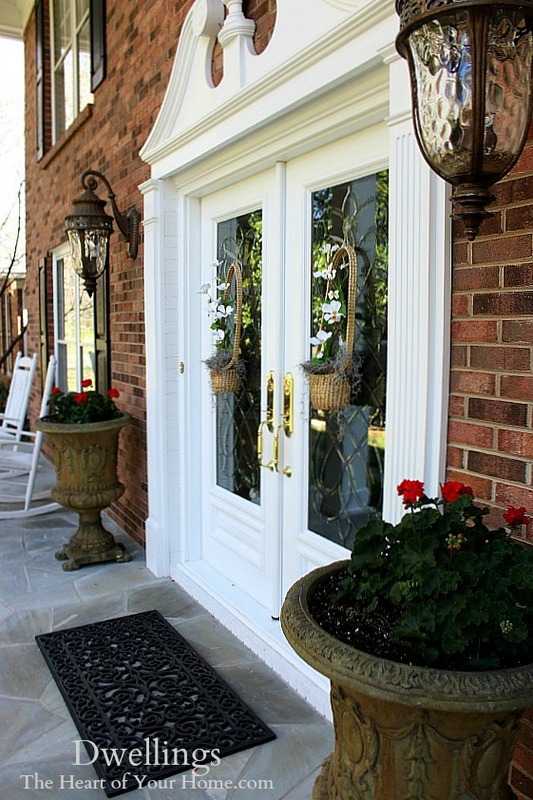 I do love porches and love to see them warm and welcoming and yours is so inviting. Blessings! The doors and geraniums are beautiful, but I LOVE the guard!! What a cute pupster!